Andrew Davies gives regular talks about the gangs of Victorian Manchester and Salford at venues across Greater Manchester. Please keep an eye on this page for details of forthcoming talks. To read an article by Andrew Davies in response to David Cameron’s call for a ‘war’ on gangs, click here. ‘Manchester’s Original Gangsters’ appeared in the G2 section of the Guardian on 22 August 2011. The G2 cover that day featured none other than Dolly Parton. At the end of a week in which the Prime Minister declared a ‘war on gangs and gang culture,’ it’s worth pausing for a moment, and reflecting on the fact that we’ve been here before. Long before the phrase ‘Broken Britain’ had been invented, something remarkably close to present-day gang culture was manifested on the streets of Victorian Manchester. It was seen in Birmingham, Liverpool, London and Glasgow too, as the period from the 1870s to the 1890s witnessed recurring panics over what today we call knife-crime. Then as now, young people were routinely demonized by politicians and sections of the press. The terminology differed, of course. Victorian gang members were labelled ruffians and brutes, barbarians and savages. But the rhetoric was used for many of the same purposes, not least to create the illusion that violence was new, and to deflect attention away from an unpalatable truth. Gangs and knife-crime have always been clustered in those parts of Britain’s cities characterized by poverty, unemployment and chronic levels of ill-health. 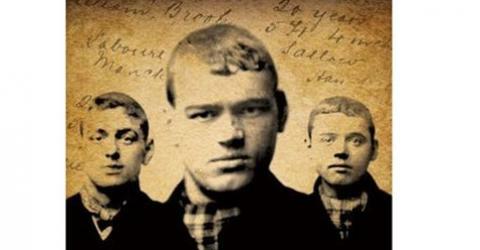 In nineteenth-century Manchester and Salford, youthful gang members called themselves scuttlers. Some of them were girls and young women, and lads and girls alike revelled in the notoriety afforded them by the press. A member of one of Salford’s gangs, John-Joseph Hillier, was dubbed the ‘King of the Scuttlers’ in newspaper headlines in 1894. For years afterwards, he wore a jersey with the title journalists gave him sewn onto the front. Victorian attempts to explain the problems of gangs and knife-crime seem startlingly familiar to us. Where modern politicians blame American gangster rap, nineteenth-century commentators blamed bloodthirsty comics, known as ‘penny dreadfuls,’ and melodramatic productions at cheap theatres. Popular culture generates new forms of gang style, but these are surely adornments, not causes. In the search for blame, Victorian parents were castigated too. As the Manchester Guardian lamented: ‘It was high time that parents should be taught their duty; at present they seem either regardless of this – or utterly afraid of punishing their children.’ It’s chastening to think that these words were written during an epidemic of knife-crime in the summer of 1890. Then, as now, the problem always seemed to lie with other people’s children. The Victorians, like ourselves, found solutions to these problems hard to come by. Gangs seemed to be largely immune to prison as a deterrent, and flooding the affected districts with police, in anticipation of what we might call zero tolerance, only seemed to disperse violence from one area to another. In the search for a solution, Manchester and Salford led the way with the formation of working lads’ clubs. These new centres for education, training and recreation, established during the 1890s, were targeted at precisely those impoverished neighbourhoods most afflicted by gangs. It took a generation, and a significant commitment of both time and money to improve facilities for young people, but as the clubs grew, gangs declined. If this episode from our past is any guide, then working with – rather than against – young people will be our best way forward. And finally, as we ponder the sentences meted out following the recent disturbances, we should bear in mind another lesson from the nineteenth century: that the punishment of young people has often been made to fit the person as much as the crime. While Manchester’s scuttlers received tough sentences from an unforgiving judiciary, the Lord-Justice General signed a letter to The Times in 1894 in defence of members of Bullingdon club, sent down from Oxford University following a drunken riot in Peckwater quad at Christ Church college. No looting was reported that night, but 500 panes of glass were smashed. In any other context, that would have constituted criminal damage. But then again, perhaps the line between youthful high jinks and mindless criminality is thinner than we care to admit. There will be a final, one-off performance of the play inspired by The Gangs of Manchester at the Dancehouse theatre in Manchester on Thursday, 15 July. Angels with Manky Faces will be performed by Manchester’s MaD Theatre Company. Angels with Manky Faces played to packed houses at the Library Theatre and the Dancehouse in 2009. This additional performance is to raise money towards the production costs of MaD’s forthcoming play, Thai Brides and Teacakes. Angels with Manky Faces features original film sequences set to classic Madchester songs, with cameos by members of The Smiths, the Inspiral Carpets, the Mock Turtles and Twisted Wheel. They appear alongside Manchester actors and DJs, including John Henshaw (Early Doors, Looking for Eric), Graeme Hawley (Coronation Street’s John Stape) and Terry Christian. For further details, including ticket agencies, see the Dancehouse website. For a sneak preview, click here for the trailer MaD made for Angels last year. In a new scene, specially written for the final performance, that bugger Bernie finally makes it onto the stage! Saturday, 30 April 2011, at 1 pm. The walk starts at outside Edwards Shoes, inside Barton Arcade, between St Ann’s Square and Deansgate, and lasts around two hours. It ends in the Marble Arch pub, where signed books will be available for purchase. For further information call Emma Fox on 07500 774 200 or email showmemanchester@yahoo.co.uk. or call 0843 208 0500. Emma’s tour finishes at the Marble Arch on Rochdale Road: one of the locations for the film sequences for Angels with Manky Faces and a stone’s throw from the opening scene of The Gangs of Manchester. Tickets for the final two performances of Angels with Manky Faces at the Dancehouse theatre in Manchester on Sunday, 8 November are available from ticketline. Performance times are 3.00 pm and 7.00 pm. Mike Garry recently read this new poem on BBC Radio Manchester. If you’re coming to see Angels with Manky Faces at the Dancehouse in November, this will get you right in the mood. In the mean time, check out Mike’s work here.